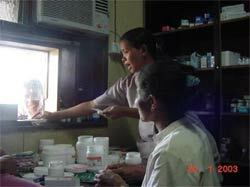 On average the clinic still sees 300+ patients per day, with a strict policy that every patient must be seen. Currently, there are thirty-two Timorese staff that help run BPC —ranging from nurses, midwives, nurse assistants, lab technicians and administrative staff. Patients come in for a variety of services, such as childhood immunizations, prenatal care, dental care, emergency care, and curative health care for conditions such as malaria, tuberculosis, diarrheal diseases, and respiratory illnesses. BPC has ten out-patient beds for patients requiring hydration, close monitoring or intensive antibiotic therapy. BPC also has ten in-patient beds serving as a tuberculosis ward for those patients that are too sick or live too far away to start tuberculosis treatment at home. During 2004 there were 99 009 general consultations, 5478 maternity consultations, 2728 babies and 2193 mothers immunized, 4 222 people received dental care and 1 001 were admitted as inpatients. BPC addresses the most serious health problems faced in Timor-Leste including TB, Malaria, and maternal and child mortality. 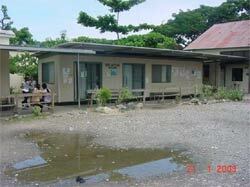 The level for demand of health services in Timor-Leste is very low by international standards. In 2003 outpatient visits averaged 2.11 visits per year nationally compared with an average of 4.0 for the low and middle income nations of East Asia and the Pacific (RDTL 2004b). Hospitals are used by less than 5% of the population compared with an average of 9% for low income countries worldwide (RDTL 2004b). The high number of patients seen by the clinic is the best testament to the clinics record of achievement. 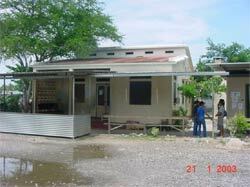 The clinic that is open 7 days a week, carries out consultations until every patient has been seen, and that is committed to, understands and responds to the situation of the people of Timor-Leste. “I am here because of my heart. I have an emotional and political commitment to the East Timorese. The outsiders that come here have no idea of the history of the people. It is very hard to do good medical care if you are only here as another stop on your job.” - Dr Dan. 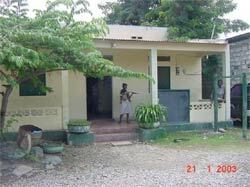 Bairo Pite Clinic is located in to the west of central Dili, in Bairo Pite. In patient's ward. 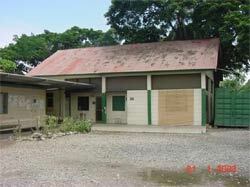 Consulting and administration building, also containing the pharmacy and laboratory.